I have said it now and will say it again ,for every smart guy there are thousands that are going to to be exploited by people like him or her. Catania (Italy) (AFP) - The Tunisian captain of a migrant boat in which 800 people are feared to have drowned is set to be charged with causing the Mediterranean's deadliest disaster in decades. 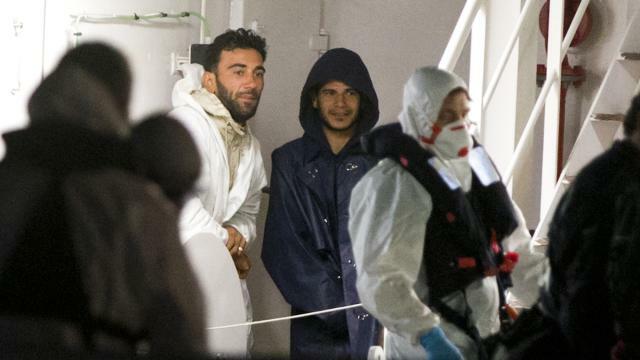 Prosecutors in the Sicilian city of Catania said Tuesday they believed Mohammed Ali Malek, 27, was responsible for steering mistakes and the reckless overcrowding which led to the horrifying shipwreck off Libya on Sunday. He will appear before a judge on Friday along with crew member and Syrian national Mahmud Bikhit, 25, who was also arrested in a probe into a catastrophe that has evoked chilling comparisons with the slave trade, and allegations of callous disregard on the part of European governments. The captain was questioned by investigators Tuesday after being arrested on suspicion of culpable homicide, causing a shipwreck and aiding illegal immigration. Bikhit faces potential charges on the latter count. Hundreds of the victims, including an unknown number of children, will have died in hellish circumstances having been locked in the hold or the middle deck of the 20-metre (66-foot) boat which keeled over in pitch darkness after colliding with a Portuguese container ship answering its distress call. The Catania prosecutors said the collision had been caused by steering mistakes by the captain and the panicked movements of the hundreds of passengers. "On the basis of what has emerged, no blame can be accorded to the crew of the merchant ship which came to rescue and in no way contributed to the fatal event," they said in a statement. Italian Prime Minister Matteo Renzi has described the traffickers who packed their human cargo into the boat as akin to 18th-century slave traders. 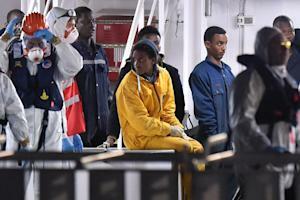 Prosecutors said the survivors had told them how they had been held for up to a month in disused factories in Libya before being packed onto the boat. One man was beaten severely with sticks as punishment from moving away from the group to answer the call of nature, according to a survivor's statement. The UN human rights chief Zeid Ra'ad Al Hussein said the horror at sea had been produced by a "monumental failure of compassion" on the part of European governments who are now under intense pressure to address the humanitarian crisis on their southern shores. Two days before Europe's leaders gather for an emergency summit to tackle the Mediterranean migrant crisis, European Commission president Jean-Claude Juncker called for a show of "financial solidarity" towards the countries bearing the brunt of the drama. Mere "compassionate rhetoric" was not enough, he said during a visit to Austria, whose Chancellor Werner Faymann would like to see massive refugee camps built in North Africa to shelter would-be migrants and refugees. The first of the 27 survivors who disembarked in Sicily in the early hours did so in a wheelchair. All of them were deeply traumatised, said Carlotta Sami, spokeswoman for the UN High Commissioner for Refugees. "They are exhausted, they have nothing left," she said. "They are in a state of shock, they look completely lost." Most of the survivors and the victims appear to have been young men but there were also several children aged between 10 and 12, she added. "We have not yet been able to ask them about this but it seems certain that many of them will have had friends and family who were lost in the wreck." At talks in Luxembourg on Monday, EU ministers agreed on a 10-point plan to double the resources available to maritime border patrol mission Triton and further measures will be discussed at a summit of EU leaders on Thursday. Critics say Triton is woefully inadequate and are demanding the restoration of a much bigger Italian operation suspended last year because of cost constraints. The survivors, who hailed from Mali, Gambia, Senegal, Somalia, Eritrea and Bangladesh, were all recovering Tuesday at holding centres near Catania on Sicily's eastern coast. Sunday's disaster was the worst in a series of migrant shipwrecks that have claimed more than 1,750 lives this year -- 30 times higher than the same period in 2014 -- and nearly 5,000 since the start of last year. If current trends continue, there could be 30,000 deaths at sea this year, the IOM warned. Italian officials believe there could be up to one million more would-be immigrants to Europe waiting to board boats in conflict-torn Libya. Many of them are refugees from Syria's civil war or persecution in places like Eritrea. Others are seeking to escape poverty and hunger in Africa and south Asia and secure a better future in Europe. Deploring the latest boat tragedy, the UN Security Council on Tuesday called for a strengthened global response to migration and human trafficking. "The Mediterranean is fast becoming a sea of misery," said UN chief Ban Ki-moon this week. Despite the prospect of further loss of life, a number of EU governments are reluctant to expand search-and-rescue operations, arguing that they only encourage migrants to attempt the crossing. Australian Prime Minister Tony Abbott said Europe should follow his government's lead by deploying military forces to turn migrant boats back. "The only way you can stop the deaths is in fact to stop the boats," Abbott said. Australia's policy has drastically reduced the number of asylum-seekers arriving on its soil and deaths at sea but has been attacked as undermining the principle of asylum.